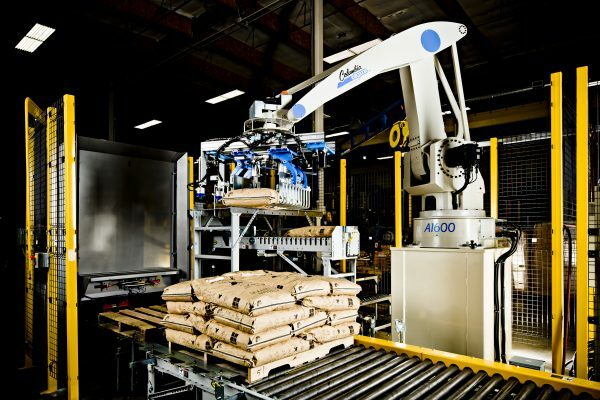 We make the best floor-level, high-level and robotic palletizers in the world. 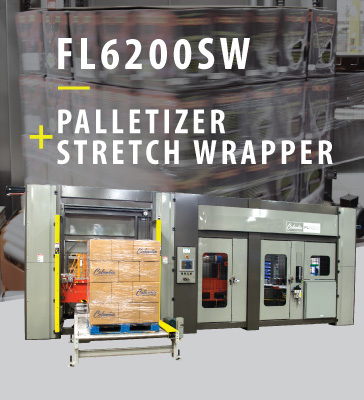 Our highly flexible machines efficiently palletize cases, RPC, trays, bundles, display packs and more, at speeds of up to 200 cases per minute. Columbia's floor level palletizer's modular designs adapt to match your space and product flow. The convenience offered by the floor level infeed, the standard category 3 safety features and the easy-to-operate Product Manager software package are unmatched in the industry. 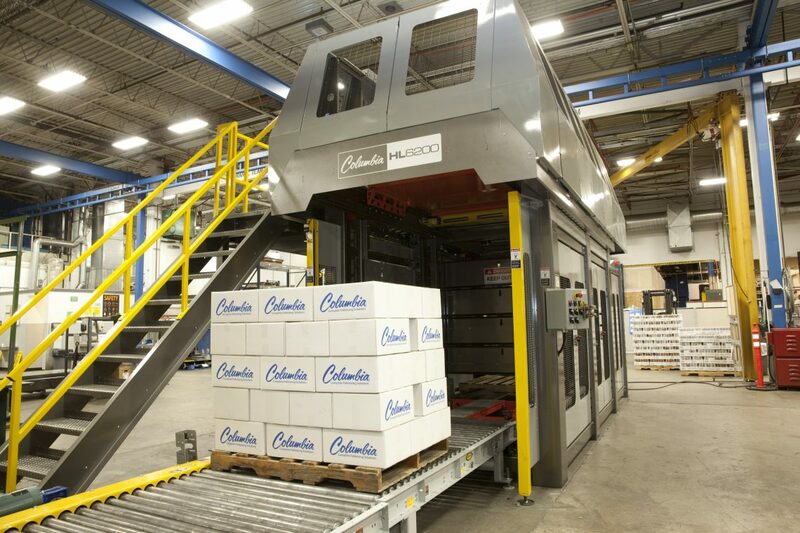 Columbia's innovative high level palletizers set the industry standard. Each of these modular machines can be upgraded to grow with your business, while versatile interfaces allow for seamless integration with your production equipment. Columbia's palletizers use a continuous motion flow divider that guides the product into the appropriate location on the layer forming area until a layer is complete and placed onto the pallet. They are ideal for medium to high speed plants and multiline applications. The LTS can help your plant become compliant with FSMA, HACCP & GMP by transferring product from one pallet type to another pallet including wood to in-house “clean” pallets, plastic to wood, or other combinations. Columbia provides complete system integration services, ensuring that your Columbia palletizer fits perfectly with your upstream and downstream equipment. Comprehensive services include concept, design, integration and installation. We make sure that the process goes smoothly, the result is outstanding, and you don’t have to juggle multiple equipment vendors. 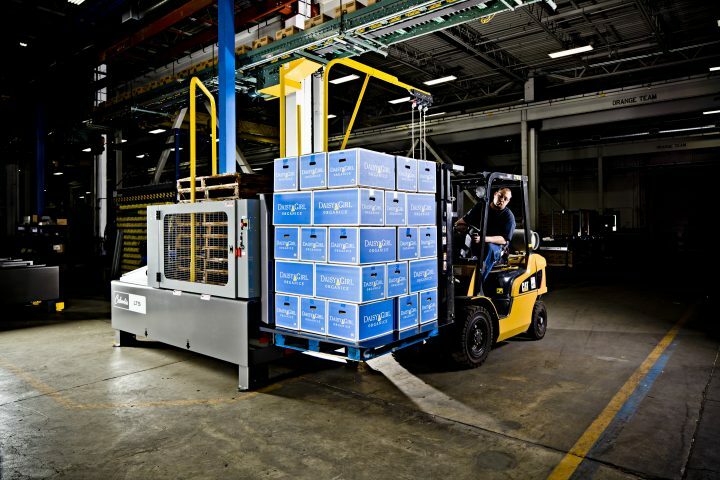 Choose from our wide range of modifications, accessories and service options to make your Columbia palletizer perform beyond your expectations. 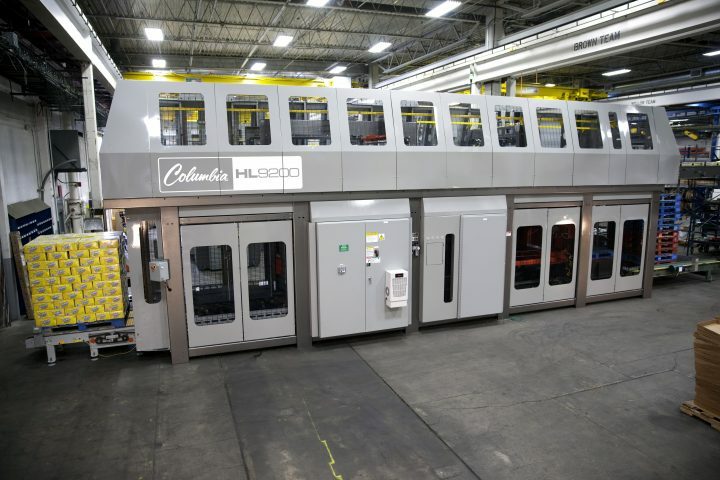 Columbia Machine incorporates industry-leading safety package, ultimate flexibility and highest performance levels into all palletizing solutions offered to ensure they are easy to operate and able to handle all current and future package types and sizes. 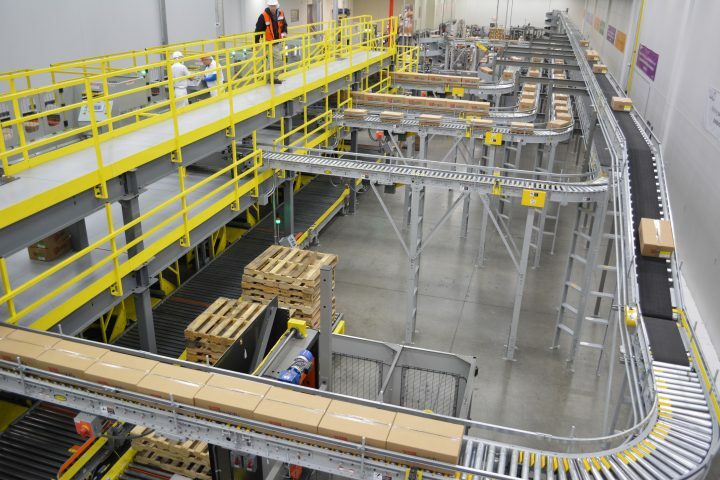 Our state-of-the-art controls package now comes standard with each of our floor-level and high-level palletizers, making our complete line of palletizing solutions even easier to operate. With the controls package, you get an Allen Bradley Compact Logix PLC, PanelView Plus 700 or 1000 Color Touch Screen and Columbia’s Product Manager. You’ll appreciate Product Manager's user-friendly interface and your palletizer’s increased up-time and productivity. The touch screen on the HMI makes it easy to make pattern additions and modifications, adjust PLC timers and VFD speeds, store up to 300 case patterns (including mixed loads) and also provides detailed alarm data. This is the most advanced and user-friendly controls package available for palletizers today. Enjoy simpler and faster start-ups with the easy-to-use touch screen. The flash memory port provides easy exchange of programs. Also included are built-in production and downtime reports to communicate production history, current status and much more. 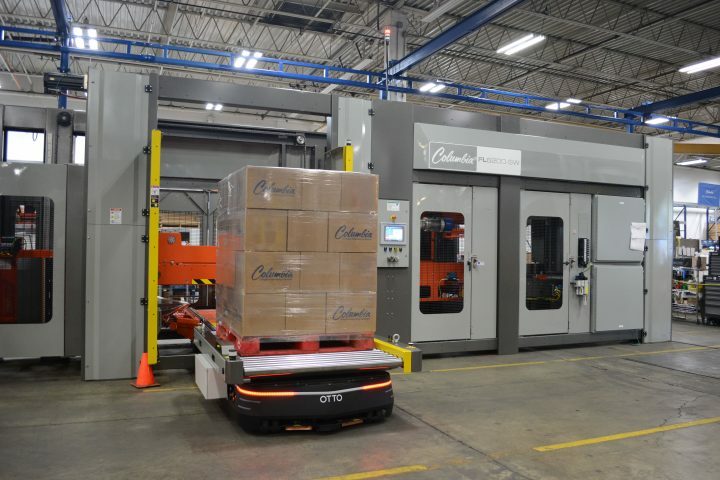 In partnership with Okura Yusoki, our state-of-the-art robotic palletizers have set the industry standard for decades. Effortlessly handle a vast range of products, pallets and slip/tie sheets without tool changes. 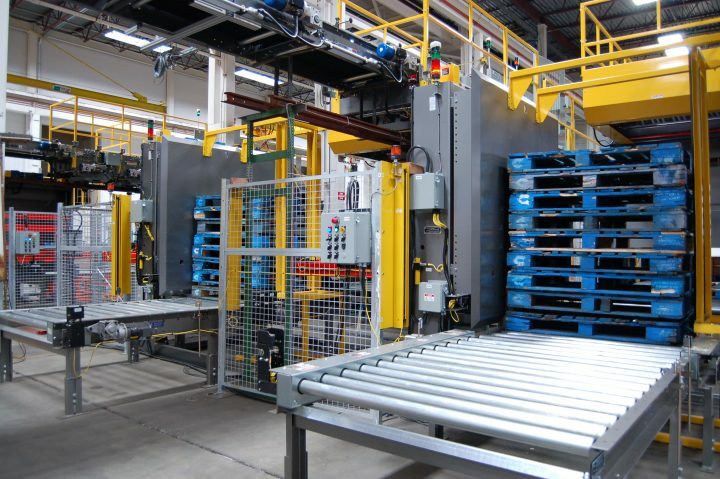 Stack up to four production lines at once, using less floor space. Enjoy automated loading and unloading designed specifically for your handling needs. 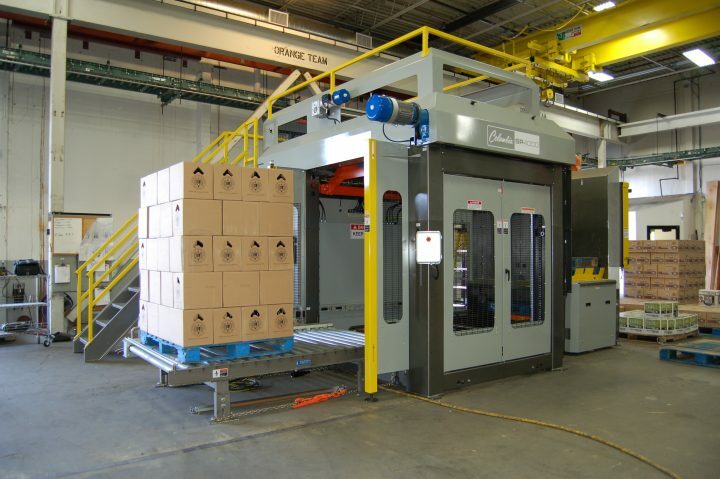 Our robotic palletizers are versatile enough to fit almost any space, speed or budget. At Columbia, we know there’s nothing more important than optimal performance within a safe working environment. That’s why our safety features offer you and your employees the best protection available. We’re constantly evaluating new safety technologies to ensure that we continue to provide the best protection in the industry. Standard features include Category 3, Performance Level D safety components that utilize fully integrated upper and lower guarding, full height light curtains, patented dual slot automatic hoist pins, infeed tunnel, fallen case detection and more. Choose from our wide range of accessories to make your Columbia palletizer perform beyond your expectations. LET US BUILD A PALLETIZING SYSTEM THAT FITS YOUR NEEDS. Send us your product, and we’ll prove we can stack it. © 2017 Columbia Machine, Inc.